College strings together four years full of whirling ups and downs from relationships, academic stress and multiple heart attacks when you can’t remember if you locked your dorm or not. I won’t tell you that a campus vaguely resembling your own slice of heaven would erase those stresses, but at least your beautiful surroundings would make one less thing to soil your spirits. Looking at beautiful architecture, bright, well-kept landscaping and blue skies plus feeling welcomed and included on campus turns a college to a home away from home. And who doesn’t want to brag they go to one of the most beautiful college campuses in America? Check out these top 10 most beautiful college campuses in 2018 and let the beauty distract you from your finals. 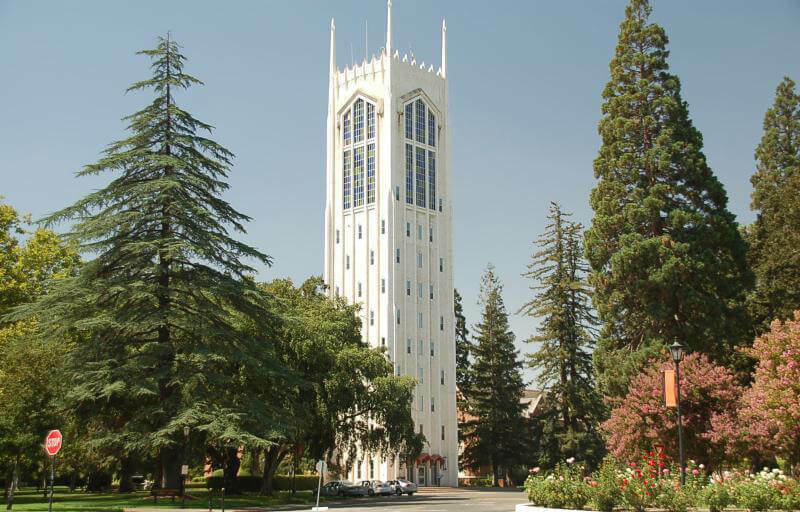 University of the Pacific’s stunning Burns Tower overlooks the entire campus with elegant spires and colorful windows. After a long week, you can celebrate another successful war against your alarm clock by heading to the campus pub called The Lair. Don’t have much to celebrate after your nightmare of a midterm? Get your mind off things with themed events that campus committees throw every month. Need some time to get ahold of your messy day-to-day life? Relax in the warm California rays on various green spaces throughout campus. Whatever your stressed out academic mind needs, whether that’s relaxing rays, peer bonding over a pint or tight-knit faculty support, the University of the Pacific campus hands it to you on a golden platter. Founded in the 1820s, this campus in Gambier, Ohio will transport you back in time the moment you step through the infamous Middle Path. “It’s hard to travel up the hill to Kenyon College’s campus and not have your breath taken away by its beauty. The campus blends century-old stone masterpieces with sleek glass-walled buildings flooded with natural light,” said Mary Keister, Director of News Media Relations at Kenyon College. 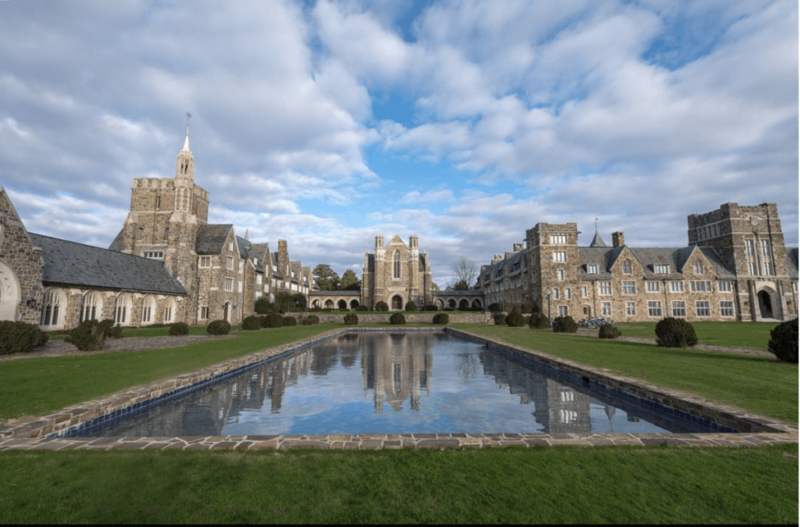 With a Gothic Revival style of architecture, the 1,000-acre campus combines a medieval atmosphere with a nature wonderland. One minute you’ll attend a lecture in what looks like a castle known as Ascension Hall and the next you’ll feel like a Disney Princess frolicking through the 500-acre Nature Preserve that protects both animals and plant life from pollution on campus. And on the weekends, students on campus gather for campfires and stargazing. Occidental College students see a hilltop overview of Los Angeles every day. “Our location in northeast Los Angeles is at the center of Oxy’s identity. The immense creativity, diversity and complexity of Los Angeles allow students and faculty to see the world’s opportunities and various social issues played out on a daily basis,” said Senior Associate Dean and Director of First-Year Admission Charlie Leizear. Looking for some motivation that extends past the reaches of the universe? Swing by the Lucille Y. Gillman Memorial Fountain where scenes from Star Trek were shot. But I wouldn’t suggest swinging by the fountain on your birthday. One of the famous traditions at this college involves throwing you (yes, you) into the fountain on your birthday. Experience Portland, Oregon like never before as you walk through a campus full of vintage-looking cottages and a majestic pond. Surrounded by forest and Mount Hood, the Lewis & Clark College campus sits atop Palantine Hill. Enjoy the scenery at activities planned by the College Outdoors like rafting, backpacking, national park visits, cross country skiing and more along the entire west coast. The Pioneers also keep their campus clean and sustainable by taking part in composting efforts as well as recycling organizations, clean energy and a low-carbon diet program. The students of Lewis & Clark appreciate the beauty that nature has brought to their campus since it was founded in 1867. And through these sustainability efforts, it will continue to thrive alongside them. Nothing beats an unexpected day where you wake up with canceled classes and a day in Disney World. Fox Day happens once every spring semester when the president rolls out a fox statue on campus at 6 a.m. Now that screams true beauty. Outside of Orlando, Rollins sits on the banks of Lake Virginia where students can enjoy the Florida sun and a beach at the edge of campus. “President Hamilton Holt was credited for the development of the Spanish Mediterranean style of Rollins campus in 1929… We still have his original master plan in the College Archives. Holt also maintained that since the college was located in the land of sunshine, its buildings should be designed with spacious and open breezeways,” said Professor Emeritus Jack Lane. Pinehurst Cottage, built in 1886, stands out against the rest of campus. Its architecture draws inspiration from New England architecture, honoring the liberal arts. 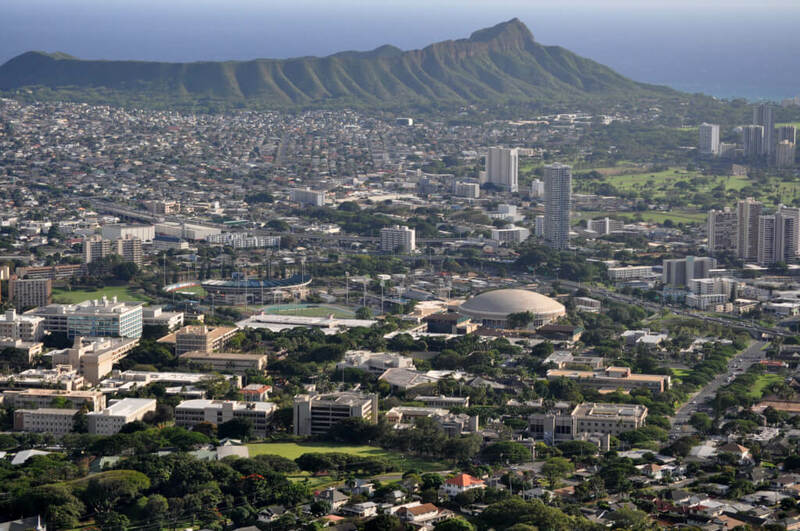 UH Manoa students achieve the brochure life and step onto a sunny, tropical campus every morning. The university embraces not only the natural beauty of the island but of the wide range of cultures that it brings together in one place. Cultural events constantly take place throughout the year bringing the cultures of Asia, Pacific Island, U.S. and more together on the 320-acre campus. Off-campus, students take advantage of the warm weather and head to the clear blue Pacific ocean to dive, kayak, swim, sail and surf. Even with academic pressures and impending life stresses on the rise, students can relax on a beach that some only experience through a computer screen. No Rice Owl graduates without a photo in front of the Sallyport Arc h at Lovett Hall. Students walking through the 300-acre campus pass 4,300 trees sprouting from the grounds and take in the unique sculptures placed among medieval- looking classroom buildings. At the beginning of an Owl’s freshman year they pass through the Sallyport Arch in the center of Lovett Hall to then walk through for the last time at graduation. “At the beginning of the freshmen’s first week on campus they tell others they’re [from] California or Illinois (etc.) and by the end of the week… they say the name of their residential college… [In] just that short week they’ve already become so at home within the community at Rice,” said Susann Glenn, Manager of Communications for Housing and Dining at Rice. Weekends include of trips to downtown Houston and the Historic Rice Village, plus walks through the campus trails. Or take in the varied light sequences from James Turel’s Twilight Epiphany Light Scape that presents shows at sunrise and sunset. Ever been to Hogwarts? 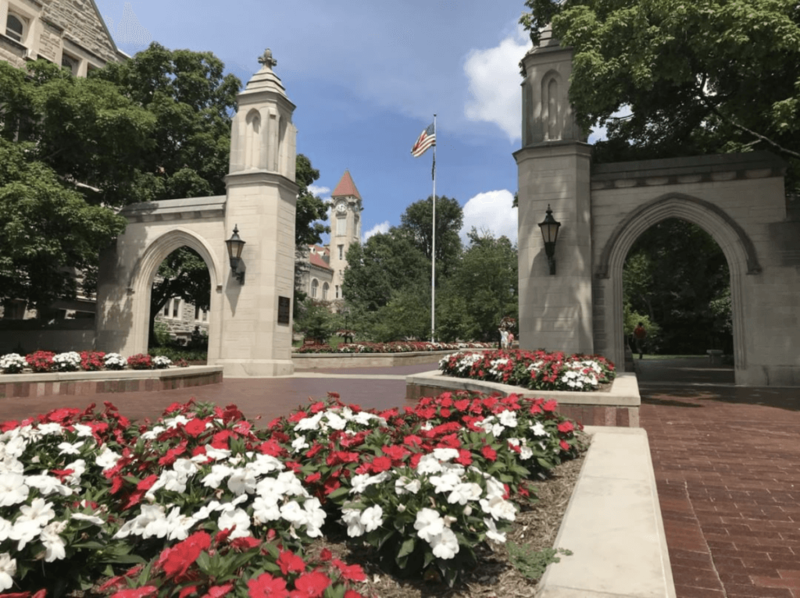 You can practically check it off your bucket list after seeing Indiana University. Countless buildings honor the history of the university by using Indiana limestone that was locally sourced in the early 1900s. This stonework contributes to the intricate architecture seen throughout campus. The Student Building on campus even made it to the National Historic Registrar, meaning the building will be historically preserved. The Musical Arts Center (The MAC) presents over 1,000 performances a year with tiered aerial seating and floor-to-ceiling windows along the lobby. Traditions sprung from beautiful spots on campus like the Rose Wall, where everlasting love comes to those who kiss there at midnight. Students can also bike through the many trails that intertwine within campus and stretch beyond it. This town thrives on contagious Hoosier spirit. The students of Berry College take conservation seriously. With a 27,000-acre campus full of wilderness, rules extended by the Georgia Department of Natural Resources protect all that students and wildlife call home. Outside of nature students find a campus full of elegant stone buildings with white accents along the windows and arches. Founded in 1902 in Rome, Georgia, the campus drew in movie sets like Remember the Titans and Sweet Home Alabama. On their free time, students follow endless trails throughout the 16,000 acres of the Wildlife Management Area on campus. “Berry’s main tradition is Mountain Day, the celebration of founder Martha Berry’s birthday. From the Grand March of Students down the mountain to the Mountain Day Olympics and Marthapalooza carnival, Berry knows how to throw a party,” said Chris Kozelle , Director of Public Relations at Berry College. This women’s college established in 1885 mixes the best of academics, architecture and community. You’ll feel like royalty stepping into buildings with architecture like that of an ancient castle—minus the fire breathing dragon. The Pembroke Arch, Neuberger Centennial Campus Center, Senior Row and Rhys Carpenter Library surround students with beauty on this campus. Like any library, you’ll find lecture halls, seminar rooms, book stacks and study nooks. But unlike most, all these resources lie underground. Above ground, students use the grassy roof for outdoor study spaces and concerts. Who else can say that they attended a concert on the roof of their library? Not most. As for student traditions, Bryn Mawr College takes the cake. Lantern Night takes place in the Cloister’s enclosed garden where sophomores hand each freshmen class a glowing lantern to symbolize the passing of knowledge from one class to another. As they leave the garden, the glittering lanterns illuminate the night as the young freshmen embrace their class’s colors around them. Bryn Mawr’s campus and student body are truly beautiful inside and out.